I’m going to warn right at the top that this book is violent AF. While violence is a central theme in the first book, it is relentless and borderline disturbing in this sequel. Sexual violence or anything never comes up in this series but there is just like a lot of throat ripping. Like a lot. 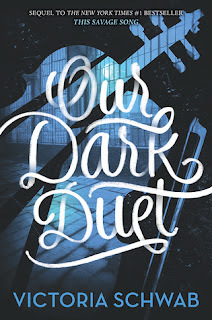 On Twitter Victoria Schwab described Our Dark Duet as being the second half of a whole but this duology felt like it was missing a book to explain how our characters went from high school students on the run to rough and tumble monster fighters. Especially concerning August Flynn who goes from bright-eyed Woobie who wants to be human to a stoic badass. It was like watching the original The Fast and The Furious movie and then immediately watching Furious 7 when they were all suddenly jumping cars through skyscrapers. Speaking of The Fast and The Furious franchise that is exactly what this book felt like. The plot was muddled, a lot of characters carry Idiot Balls and the whole thing probably could have been solved with a text message chain but all that said... I was just swept away in Schwab’s cinematic storytelling, breakneck action sequences and creative set pieces. Look, I'm not sure why characters are suddenly using call signs and August is getting around by jumping from skyscrapers but you know...Rule of Cool. As always snaps to audiobook narrator Therese Plummer, she came to slay this audiobook. Her vocal performance is nonstop for every section of this book. Even in the interstitial sections where there are no dialogue tags, she is constantly adding her own vocal tones and interpretations. In the Kirkus review for this book, they mention that the addition of the nongendered character of Sorrow as “exciting but problematic”. There is no explanation for why it may be problematic in the Kirkus review but I think it’s because Sorrow is a Sunai, a human-like monster created from acts of mass violence and doesn't understand humans or the concept of compassion. I could see how the idea of nongendered person = cold monster could be seen as problematic. While it was a good listen I can’t say this book satisfies anything the first book didn’t. I think if you just skip the last chapter of This Savage Song that sets up the plot for this book you're good with stopping at book 1. So many female characters sacrifice themselves in this book. SO. MANY.